So I am all stuck in bed with an Icy Hot Patch on my back drinking Iced Tea (see this post) working on blog templates, updating the shop, & watching Bio. I really was excited to get to making something yesterday & this morning for Make It Monday.....but since I hurt my back yesterday, I haven't been able to move! In the studio yesterday, I started to wedge clay with a little twinge in my back. I dismissed it because I've always had a little bit of back pain. I plopped my clay down on the bat & began to center it. All was well until I sat up. OUCH!! I was nearly blinded by pain. Whoops! So I laid on the floor for 2 hours while Katie made a few things. It hurts less than yesterday but I still can't move around. Any way, I decided to finish up the photos for this awesome DIY today & post it: A DIY faux enamel ring. Enameling has its roots in ancient history in decorating everything from stoneware, metal objects, & jewelry. The basic enameling process includes adding glass powder to a metal surface & heating the piece until the glass melts. This process adheres the glass to the metal creating a decorative piece. I've been really inspired by Art Nouveaux enamel ware & decided to try to imitate the look of enamel with nail polish. Nail polish?!?! Well, it is also called nail enamel. What could it hurt. When I saw a great brushed gold ring on sale for about $3 at Icing, I scooped it up and saved it for this DIY! While at the craft store I also saw these ring blanks with deep wells perfect to hold the nail polish since it would have to fill up a space too get the right effect. Uncap the polish & set the brush where it won't drip on something nice! pour a little of you polish into the center of the ring & rotate. Be sure not to over fill! The rotation will help distribute the polish evenly & you can always add more if need be. Line them up to let them dry & make sure to keep them level. Let dry for a long time! You'll need at least 24 hours to let them dry. You might be able to speed it up with a fan. The longer you wait the better. 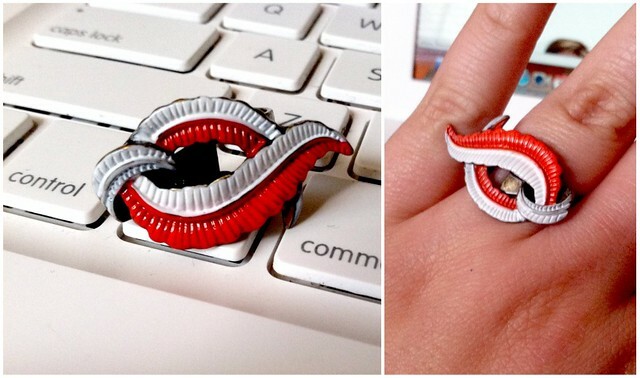 You don't want to accidentally create a texture on the ring by pressing something into it! You could add another level of interest by using a glitter polish or even try the nail polish you made from the earlier DIY. 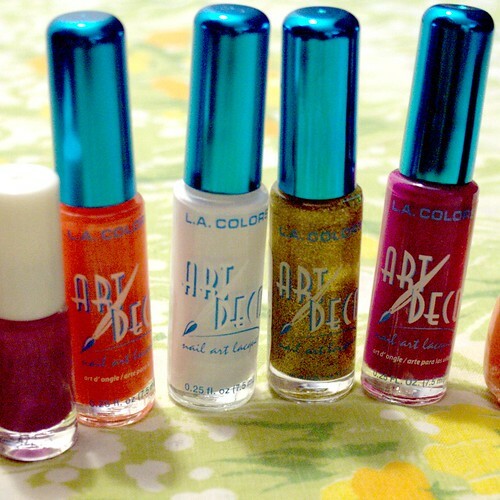 Since the polish came from the dollar tree, it won't be wasting a precious color! I found the LA Colors Art Deco polishes at the Dollar Store & found out they have a really thin brush perfect for nail art & precision perfect for painting the textured feather ring. The texture on this ring came to life with the color on it & really emulates the Art Nouveau look I was going for. 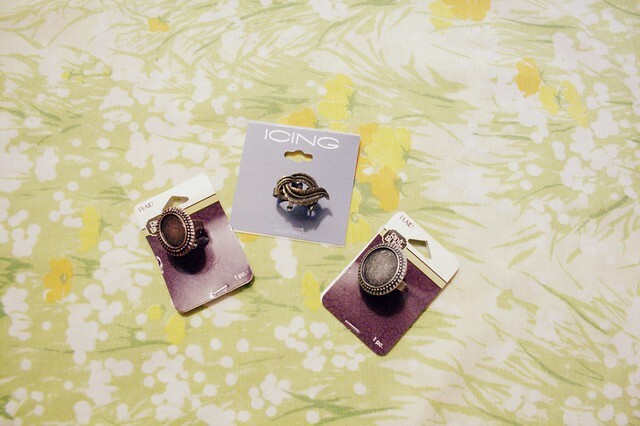 You can spruce up thrift store brooches & rings, jewelry you've gotten on sale & aren't too attached to. What crazy things have you done with nail polish??? i hope your back is feeling better!! I am looking forward to best Fashion Rings Online store in USA? can anyone suggest me the best one? I think you should consult to PALOMAR FASHION Wholesale Earrings dealer?